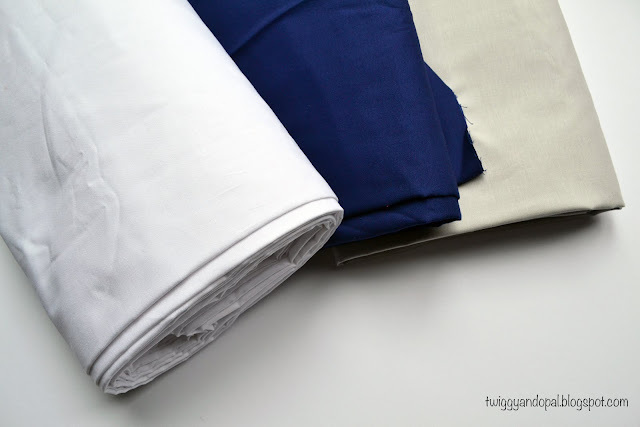 There are basic fabrics we need on hand all the time. Like white. Lots and lots of white!! And of course one of my favorite background colors such as gray. If I could I would have bolts of these two on hand times two! I used the last of my Kona white on my Drunkards Path quilt. Which was just barely enough, but I got clever and was able to make it work. I knew I had better get more ordered and the quicker the better. I would love nothing more than to buy by the bolt on a couple colors. Since I don't have a connection the next best thing is buying from fabric.com. They always have a buy more, save more on most of their Kona cottons. For 10 yards of Kona white, I was able to get the price down to $4.34 a yard. That's not bad! While white is must, probably my favorite background/backing color to use and have on hand is Kona Shadow. My dark blue stock was also getting low, so welcome Nightfall! I've been trying to find a Neon Pink solid with very little success. These lovelies made it in my cart for 'just in case', but they were a far cry from Neon!! I tried unsuccessfully to grab Kona Color of the Year Pink Flamingo when it first arrived on the scene. When I saw it was actually in stock...I pounced. Tell me why I didn't buy more than one yard! Because it's really, really pretty to me! This is my second batch of Diamond Hexie Stars. I started making them while I was in Oregon. Star Light, Star Bright was my first batch. I've decided these will be my long term project for the rest of the year. 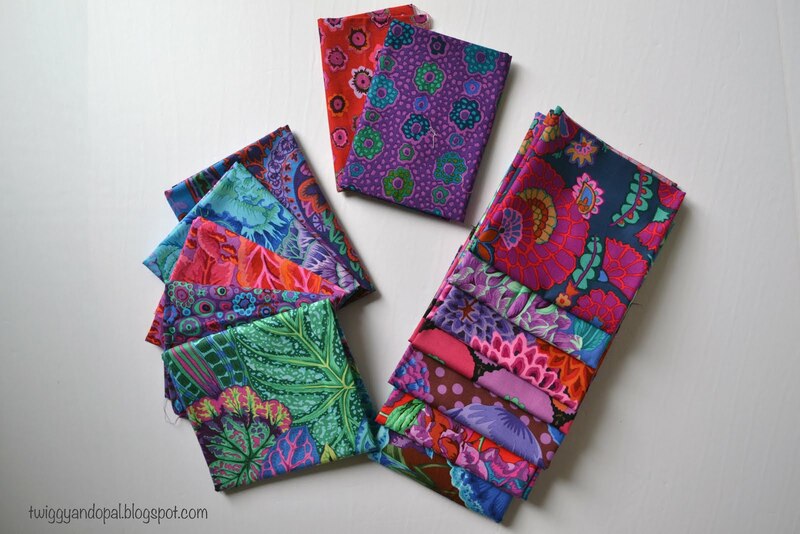 I'm using bright Kaffe Fasset fabrics and fussy cutting for the most part. But I needed more...and when I was tempted with more...I couldn't resist! 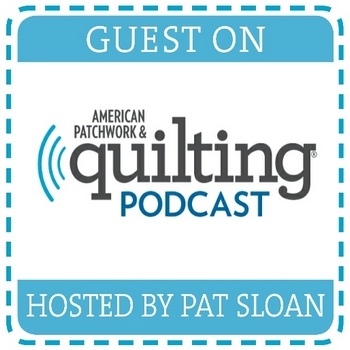 Cyndy at Quilting is more fun than Housework offered up a hand picked bundle to fulfill my EPP diamond project. I loved her note! I know!!! What the heck is going on with me and prints? You'd think I have finally developed a relationship with prints after all these years! I see many more diamonds being cut from these fabrics and I think I'll start right now! There it is, my latest acquisitions to my stash. Some must haves, and some gotta haves! Can't wait to see more of those pretty hexagon stars. The colors are amazing! I ordered a bolt of Shadow to add to my stash. I know it is a favorite of yours so I thought I would give it a try. I find I use navy the most. I spent part of yesterday cutting from the new fabric for another batch of stars! I still have no idea where this project is going…but I’m excited about it! Shadow is a good alternative to white, very good choice!! I adore those pinks and your hexie stars are beautiful! Kaffe Fasset's patterns and colours are fantastic. They look beautiful in your diamond hexies! Lovely project! Wow, buying bulk from fabric.com really drove the yardage price down to an amazing buy! I have a bolt of Kona White and Kona Silver at the moment (although both are nearing the end). I might consider bulk buying from fabric.com to replace, although I have found they are not very careful in their packaging and shipping. 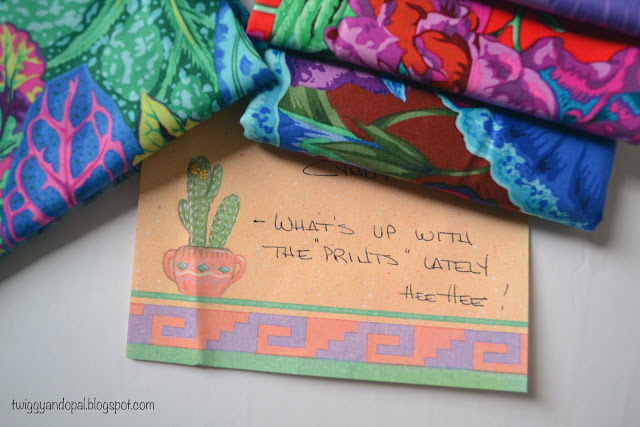 I love to see the prints and bright colors you are picking up and look forward to seeing what you create! Since I can’t get a deal on a bolt, and frankly I don’t know where to even look, the fabric.com deal is the best I’ve found. I have had a few issues with them, but for the most part I’ve had good experiences! Where do you buy bolts from? And is it a good deal? You are definitely blessed with fabric! Enjoy. Nadine Willis N. Cali. Backgrounds are hard to keep around. I had to add some gray to my stash for an upcoming project. Love the Kaffe Fasset prints and those blocks. I've got a few KF prints stashed away, waiting on the right project. Looks like you found yours. I am thrilled with my hexie stars and using Kaffe Fasset fabric for them. I think the solids around each star was the clincher for me!! Backgrounds and backing is hard to keep on hand! I don’t think having too much is a bad idea! Wow, you got a great deal! I love a lot of fabrics, but I would have a hard time committing to a whole bolt of any one of them. I think that's brave! 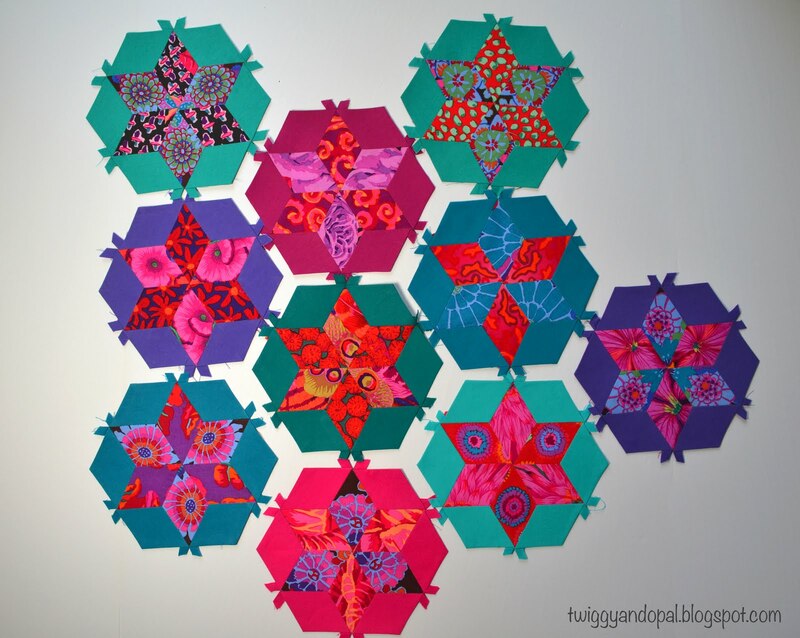 And I love your hexie stars! Oh I love all that Kaffe colour you have going on in your stars! Are you hand piecing them? Oh mercy that star project is beautiful. I wish I could afford to buy Kona by the bolt. Your stars are awesome! Beautiful color combinations! I tried that sew quickly website but got an error page. Any idea of how to get the PDF? I just tried sewquickly.com but maybe I'm doing something wrong? Any idea? I was just getting ready to order a whole bolt of Kona White myself! Love that Flamingo - so pretty! 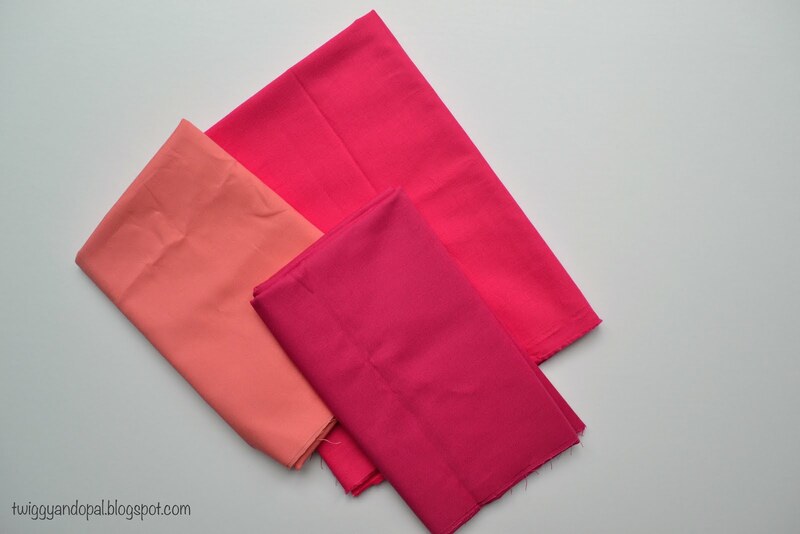 Robert Kaufmann makes a bright pink kona cotton. I found some on kawaiifabric.com and onlinefabricstore.com. You are really making progress on the stars. How fun! I buy a bolt of my standard Kona colors at Joanns when I have a 60% off coupon. I don't think you can beat that!